A version of this article appeared in The Diplomat, September 25 and in Newsweek Japan (in Japanese), October 7, 2014 (see links at end of article). Japan’s decision last week to continue hunting whales in the Antarctic despite the International Court of Justice’s earlier ruling that its “scientific whaling” program there was illegal should now prompt a major rethink of global efforts to end Japanese whaling. With Tokyo now seemingly on a warpath to create an open-ended “research program” that the world court would sanction, anti-whaling countries and NGOs need to change their game plan. 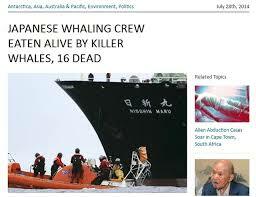 One way to do that is to give Japan what it says it really wants – a resumption of commercial whaling. Far from decimating whales, the return of whaling on purely commercial terms would actually be the best way to save them. Now in its twenty-eighth year, Japan’s “lethal research” program has killed over 14,000 whales in the name of science, with little to show for. In March, whaling opponents hailed the world court’s ruling that Japan’s research program in the Southern Ocean, a designated whale sanctuary, was bogus science and simply a masquerade for commercial whaling. The finding echoed what many scientists, governments, and NGOs had been saying for years. Tokyo initially said it would abide by the decision, but last week at the annual whaling conference, despite an overwhelming vote against continuing its “research program,” announced it would unveil a new scheme it hopes will meet the court’s objections and enable it to resume its annual hunts. This would be alongside the several hundred whales Japan kills off its coast every year under a separate program not covered by the court ruling. Japan is likely to spare no effort to get the world court’s stamp of approval. If granted, it would then have the legal backing to conduct an open-ended program of “research whaling” for decades to come. While the renewed program will initially be smaller in scale, Japan’s in-your-face incrementalism when it comes to whaling guarantees that it will not remain that way for long. When commercial whaling was banned in 1986, Japan took advantage of a legal loophole that allowed countries to conduct lethal research whaling and sell the meat from their catches on the commercial market. Every year since, Japan’s fisheries agency has authorized the numbers and types of whales its fleet can catch for “research.” In 2013, a typical year, it issued a quota for the killing of 935 minke, 50 fin, and 50 humpback whales in the Antarctic. While Japan’s whalers greatly benefit from the current scheme, the Japanese government and the country’s shrinking fisheries industry continue to fight for an end to the 1986 ban and a resumption of commercial whaling. They argue that hunting and eating whales are part of Japan’s cultural heritage, and attack opponents, mainly Western countries and NGOs, for their “cultural imperialism” and “double standards,” regularly pointing to Australians’ appetite for kangaroos. That Japan is now going all out to morph its bogus research program into something the international court would legally sanction is not surprising. For years, its whaling programs have enriched and empowered an interlacing web of business, political, and bureaucratic interests often at odds with many of Japan’s larger national objectives, such as environmental stewardship. The result is that whaling in today’s Japan is neither “research” nor “commercial.” Now an essentially state-run enterprise, it has all the trappings of the worst kind of market-distorting subsidies and wasteful government spending that rival the world’s most inefficient state-owned corporations. Set up in 19 87, the non-profit Cetacean Research Institute runs Japan’s whaling program. It owns Japan’s whaling fleet, hires its mariners, and distributes and stores whale meat. It receives tens of millions of dollars annually in government subsidies for its services, topping over $50 million just for the most recent fiscal year. It is also where many retired officials from Japan’s fisheries agency and other bureaus go after retirement, forming an extended iron rice bowl system of lucrative sinecures that helps ensure Japanese whaling survives. But if Japan is serious about making commercial whaling a reality, this picture of government largesse and political coddling will have to be redrawn in radical ways. As in other fisheries management schemes, the government would set quotas based on previous years’ catches. But initially, these would be set to reflect levels of actual consumption to avoid over-fishing. 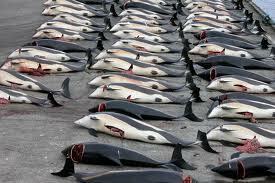 Penalties for exceeding quotas would help solve the unconscionable practice of stockpiling tons of excess whale meat. Some 5,000 tons currently languish in taxpayer-funded warehouses. 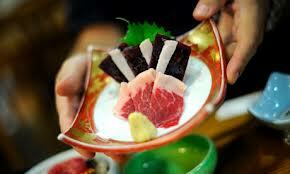 These mountains of frozen whale meat reflect the fact that modern Japan simply no longer has a taste for it. An April 2014 Asahi Shimbun poll revealed that only 14% of respondents occasionally or rarely ate whale meat, with 37% saying they never ate it. Other polls showed 90% of Japanese surveyed had not bought whale meat in the previous 12 months and only 11% were strongly in favor of continuing whaling. An overwhelming 85% were opposed to building new whaling ships. And if the absence of demand were not enough, any private investor would also have to contend with the international condemnation that accompanied commercial whaling, together with attacks from NGOs, like the Sea Shepherd, and boycotts of its other businesses. Such pressure helped convince Rakuten, Japan’s largest online shopping mall and biggest online retailer of whale and dolphin meat, to announce earlier this year it would stop selling those products. With whale meat consumption in Japan down to just 1% of its peak in the early 1960s, any notion of earning a profit from a return to commercial whaling now seems quaint. Given Tokyo’s determination to “legalize” its “research whaling” program in the Antarctic at all costs, now may be a good time to call its bluff and make it an offer it can’t refuse: give up your bogus research and state-run whaling programs and subject them to market forces. Only then will we know if Japan truly has a stomach for eating these gentle giants of the sea. Martin Murphy is a former US diplomat and was Deputy Counselor for Environment, Science and Technology at the US Embassy in Tokyo. He was a US delegate to the 2005 International Whaling Commission annual conference in Ulsan, Korea.